I have created templates for two diamond fold cards with a finished size of 100mm x 100mm (4 x 4 inches) when folded flat. Template 1 has diamond size of 100mm (4 inches) square. Template 2 has more folds and a diamond size of 70mm (2¾ inches) square. Both templates would be easy to scale up if required. Diamond fold card template 1. 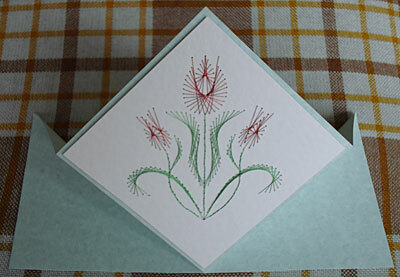 I have used template 1 with the PinBroidery MM-4 Mini Tulips Pattern for the card above. 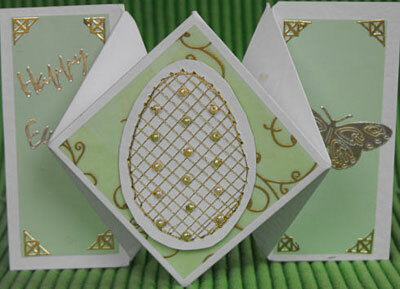 It is stitched on white card and mounted on the diamond fold card with sticky fixers. The card is made from a sheet of card 200mm x 200mm (8 inches x 8 inches). Mark the edges at 100mm (4 inch) intervals. Cut away the bottom-right square. Score the dotted lines. The blue dotted lines are valley folds and the red dotted lines are mountain folds when viewed from the front. The finished card will measure 100mm (4 inches) square when folded flat. Diamond fold card template 2. I was inspired to write this post about diamond fold templates when I saw Patsy’s beautiful Easter Diamond card in the Form-A-Lines forum gallery. It is shown above. Patsy used the free Easter egg pattern from this website. She reduced the pattern size to 65% to fit the diamond shape. Template 2 is similar to the one used by Patsy. The card is made from a sheet of card 300mm x 100mm (12 inches x 4 inches). Mark the long edges at 50mm (2 inch) intervals. Score the dotted lines. The blue dotted lines are valley folds and the red dotted lines are mountain folds when viewed from the front. The finished card will measure 100mm (4 inches) square when folded flat. The templates are in a PDF file and you will need Adobe Reader to view and print them. Adobe Reader software can be downloaded free of charge from the Adobe website. Please let me know how you get on with these templates by adding a comment to this post. Thanks for using my card as an example – I love this diamond fold. I will certainly now try your version of the fold and let you know how I get on. I do think the finished effect of this fold is amazing. Thank you for sharing these templates. I’m so looking forward to trying them out. Thank you for sharing these templates.love the card. very nice.